Like most other cloth diaper outlets, they offer the top name brands most of us are familiar with. However, I was thrilled when Joy offered to send me a unique item– a diaper cover that they just started to make themselves, with a hemp soaker, all made by them in MN. From Joy, the owner” Our business tries to sell as much “made in the US” products as I can that are healthy for babies and the environment.” The description they have online describes this diaper perfectly: NEET One-size designer covers! Made locally and sustainably here in Minnesota. Give your baby a fashionable bum and all the benefits of a very reliable and well-made diaper cover. $18.95 for the cover, insert(s) not included. http://www.littleneetchersdiapers.com/products/page/NEET_One-size_Covers •Ones-size fits most babies from 8-30lbs. •Soft inside, leaves no red marks on baby’s skin •GREAT fit! Trim with no bulkiness or sagging •Made in the USA My babe is ~32# and this diaper still fits very nicely, and it’s true that it is snug with no bulkiness, while not being too tight that it leaves red marks. I only have one other Velcro diaper in my stash, the rest are snaps, and honestly I don’t love the other Velcro diaper I have (from SoftBums) because my toddler is easily able to get it off, even when it was brand new. However, the Velcro on this diaper is very tough for him to get off himself, it latches & holds very well. The cover comes in 12 very cute patterns, mine pictured is the Garden Gnomes. There are 3 rows of snaps lining the front so it truly is adjustable from newborn to toddler-size, which is something I love about these types of diapers. This is the insert sent to me with the diaper:. NEET Hemp Soakers. $12.95-$15.95 (S,M,L) for a 2 pack. Looking for something amazingly absorbent and trim, here you go! 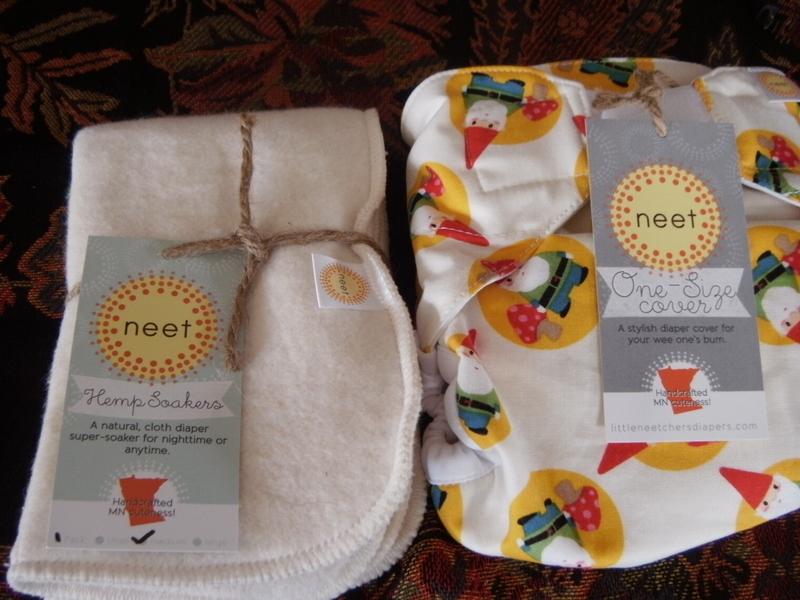 http://www.littleneetchersdiapers.com/products/page/NEET_Hemp_Soakers •Organic Hemp Cotton Blend •Super soft, super absorbent •Simply fold in half to use in covers •Great nighttime solution These indeed are amazingly absorbent & trim, and the perfect fabric to have right next to your babes skin. You could use an insert of your choice of course, and they offer several different options. I’ve tried the diaper cover with other inserts I have on hand & it works well. The awesome news is that my babe, who recently turned 2, has taken to using the potty and we are going through diapers at a much slower pace! But, with babe #2 coming in a couple of months I’m thrilled to have this diaper added to my stash, and will update this review when I start using it on my newborn! Thanks for sharing this diaper with me Joy, I know where to come for all my diaper needs in the future!